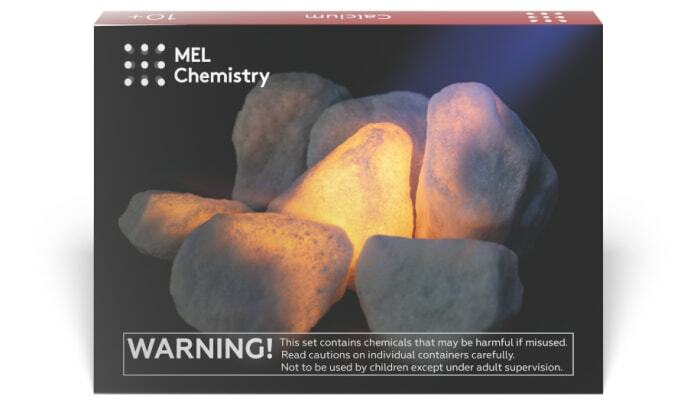 This experiment is included into "Calcium" kit along with "Calcium flame" and "Glowing marble". Subscribe and get everything you need to do this experiments at home. The calcium hydroxide Ca(OH)2 isn’t dissolving well in the water. Is this normal? Yes, this is exactly as it should be. Calcium hydroxide is only slightly soluble in water. Dissolving the given volume of calcium hydroxide in its entirety would require almost 2 liters of water! Thankfully, this experiment only requires that we mix calcium hydroxide thoroughly with water, not that we make it dissolve completely. 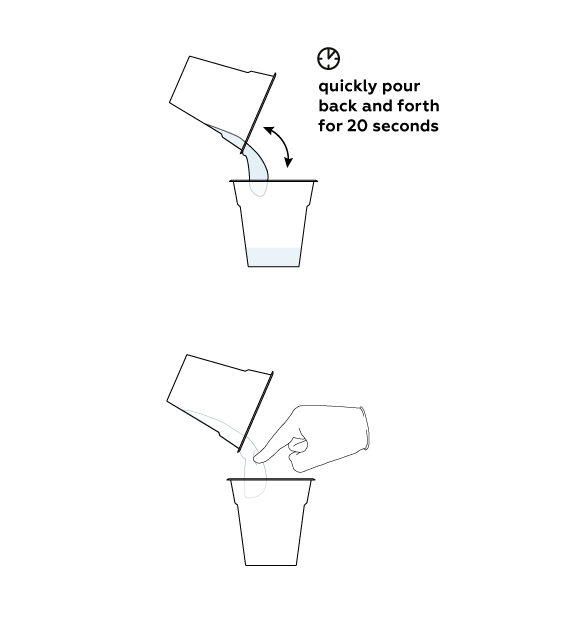 Why do we keep pouring liquid from one cup into the other? When you mix the contents of the two cups, you are creating the mixture that will eventually solidify. This transition from one state into another is easiest to observe if you keep pouring the mixture. This is also why you should first pour the liquid glass into a separate cup. Adding it directly to the calcium hydroxide would cause the mixture to solidify too soon. The liquid hasn’t solidified – it only formed lumps. What’s wrong? Perhaps the calcium hydroxide and water weren’t mixed thoroughly enough. This can cause the reaction to happen unevenly or with a significant delay. 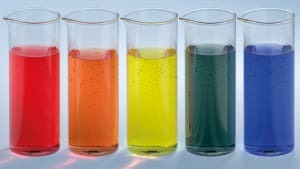 Try to mix the contents more thoroughly or repeat the experiment. 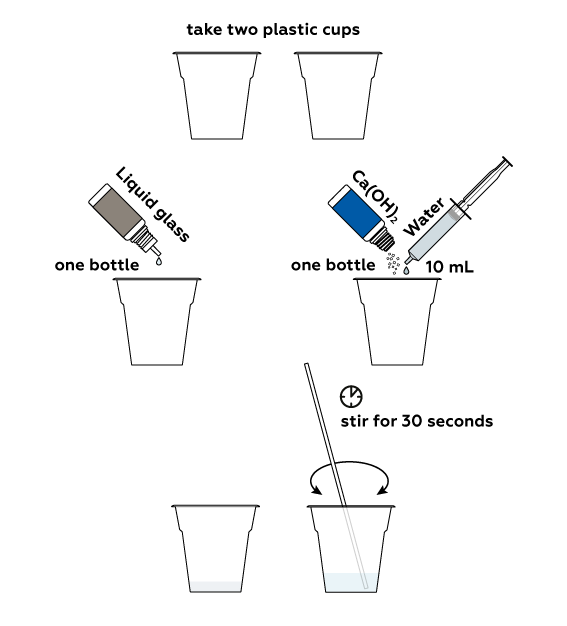 First, prepare two cups: one with sodium silicate solution (also known as liquid glass), and one with calcium hydroxide solution. Calcium hydroxide Ca(OH)2 reacts with sodium silicate Na2Si2O3 and this provides the insoluble calcium silicate CaO*SiO3. This is why the solution hardens right in the air! By the way, calcium silicate is a rather popular material for modern day industry. E.g. it is used for passive fire protection and in some types of cement. Liquid glass is basically sodium silicate Na2SiO3 and it dissolves very well in water. Ca2+ from Ca(OH)2 readily replaces sodium Na+ to produce calcium silicate CaSiO3 which is almost completely insoluble. Normally, this compound looks like a boring white powder. But why on earth does it absorb all the liquid in the cup and form a solid chunk of crumbling soapy stuff instead of settling to the bottom as a decent precipitate would? The answer lies in how exactly the calcium silicate is formed. The reaction mostly takes place on the surfaces of tiny undissolved Ca(OH)2 particles , providing them with CaSiO3 crystal needles , which eventually interlock with those of the neighboring particles, soaking in all the liquid at once. Exchange Ca(OH)2, for something more soluble, like CaCl2 and you'll get the same CaSiO3 falling peacefully to the bottom. In pretty much the same way, such seemingly different things as chalk, eggshell and marble are all basically the same compound—calcium carbonate CaCO3. But the exact process by which each is formed strongly influences how it looks. What is the substance we obtained? The material produced in this experiment can be called a plastic. Plastics are typically organic substances and contain a significant proportion of carbon and hydrogen atoms bonded together. However, the plastic in this experiment is of a different nature: there is no carbon in it at all. It is made of silicon Si, oxygen O, sodium Na, and calcium Ca. 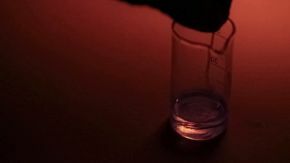 The key reaction used to produce this material is the combination of silicon and oxygen atoms, a combination that can often be found in silicates. Since silicates are inorganic substances, such plastics are called inorganic or silicate plastics. Liquid glass consists mostly of sodium silicate Na2SiO3 and a few other, similar sodium silicates, the only variable amongst them being the proportions between sodium Na, silicon Si, and oxygen O atoms. Liquid glass is actually a stable form of the sodium silicate solution in water. Liquid glass is an inorganic polymer. Polymer molecules are very big but relatively simple, consisting of a large number of repeating fragments (monomers) connected one to another via chemical bonds. You can picture a polymer as a chain consisting of a number of identical elements. Liquid glass, however, is an anionic polymer. 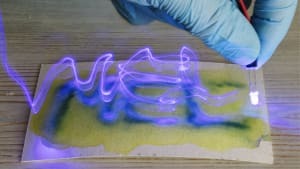 When dissolved in water, anionic polymers form long, negatively-charged chains with a corresponding number of positively charged ions surrounding them in the solution. Liquid glass specifically (which is actually sodium silicate Na2SiO3) consists of polymeric silicate anions (-Si-O-Si-O-) with Na+ ions floating around them in the solution. 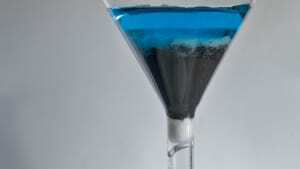 Why does the reaction mixture solidify? The mixture solidifies due to a chemical reaction between its two main components: calcium hydroxide Ca(OH)2 and liquid glass (Na2SiO3). 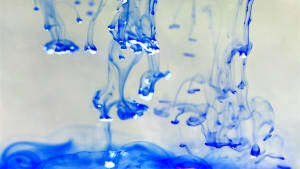 Together, they form a solid material that is insoluble in water. 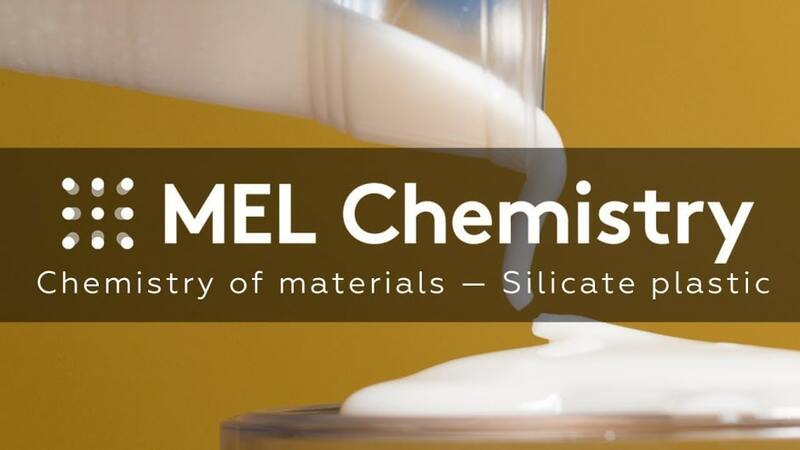 This material strongly resembles the common silicate glass used in windows, mirrors, drinking glasses, etc., which is made of bonded calcium, sodium, and silicate ions. Why is this glass-like mixture ductile, not hard? The nature of the calcium hydroxide Ca(OH)2 determines the outcome. If we add another source of calcium (for example - CaCl2), we will create a solid, crackly material that bears a strong resemblance to sand. This is why the material forms relatively slowly and all over the solution simultaneously. At the beginning of this process, tiny but constantly-growing bits of insoluble calcium silicate form. Gradually, thin bridges materialize between these bits, connecting them in a cluster that gradually spreads all over the solution. These bridges are rather strong, so the resulting particle does not collapse. At the same time, the bridges are also flexible, so the resulting substance remains ductile for quite some time. Try thinking of the flexibility of these bridges of glass-like material like this. It is impossible to bend a glass rod as thick as a pencil – it will break (but don’t try this at home – it’s dangerous!). However, it is possible to bend a glass rod if it is as thin as a thread. These bridges are even thinner, invisible to the naked eye, so they are much more flexible. Moreover, even if some of the bridges break due to excess pressure, this will not affect the network as a whole. Why does the material lose flexibility with time? The substance dries as water evaporates from it. Dried calcium silicate resembles white sand. Again, water is key. More specifically, the key is in how it evaporates. As the material gradually dries, water molecules no longer prevent the calcium silicate clusters from sticking to each other. Also, the formation of the bridges we described above is not the end of the process. Calcium ions Ca2+ slowly enter the solution and firmly bind the growing clusters of material to one another. This is why the properties of silicate plastic become similar to those of a glass rod, which would sooner break than bend. Can we reverse the drying process and make the material flexible again? No, we can’t. There is no way to recreate this material starting with sand-like calcium silicate. This material was ductile partially due to the way we obtained it from the initial reagents.